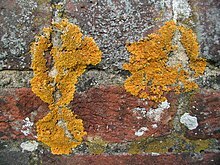 Xanthoria parietina, seòrsa cumanta de chrotail. 'S e crotal fàs-bheairt prìomhadail a tha na cho-aonachadh co-bheathachail de fungas agus companach foto-cho-churach, mar as trice lìrean (iolra: crotail). Tha morf-eòlas, beò-eolas, agus bith-cheimigeachd nan crotal gu math difirte bho na th' aig an fhungas agus an lìrean. Gheibhear crotail ann am farsaingeachdan iomallach, mar tundra Arctaig agus fàsaichean teth, agus tha iad gu math cumanta a' fàs air clachan agus stocan is meuran craoibh air feadh an t-saoghail. Air a tharraing à "https://gd.wikipedia.org/w/index.php?title=Crotal&oldid=507328"
Chaidh an duilleag seo a dheasachadh 29 dhen t-Samhain 2015 aig 14:45 turas mu dheireadh.